NEW Gem Medium Format Case ideal for Compact System / Bridge Camera and limited accessories. Padded main compartment with removable padded divider. 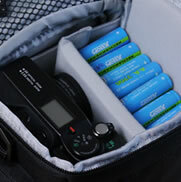 Quick access side pockets ideal for spare batteries. 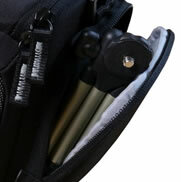 Three Way Carry System - Use the belt look, padded carry handle or even the shoulder strap also included. 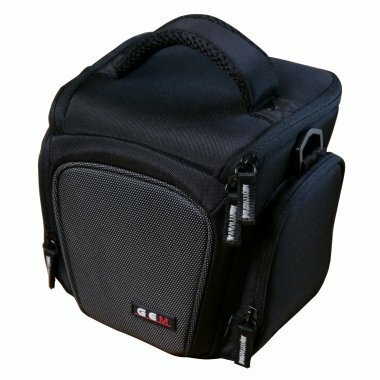 This case by GEM has been specifically designed to carry a medium sized camera such as Bridge and Compact System Cameras with a few additional items such as spare batteries, memory cards, etc. It is ideal if you require a case that is not too bulky if all you want to take out with you is your camera and a few accessories, with it also being a case that has been designed to be easy and practical to use along side your camera. Douglas May 13 A brilliant bag - well made and well thought out (the divider inside for example). All zips seem very solid. It's quite understated too, I like that. I'm using it for a Lumix GX1 plus 3 prime lenses and a few bits in the side pockets - absolutely ideal, and a bargain. Highly recommended. Excellent fast service from GEM too. 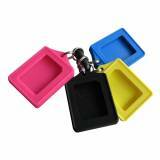 Ross Andrew June 13 Appears to be a good quality product, excellent next day delivery and well packaged.